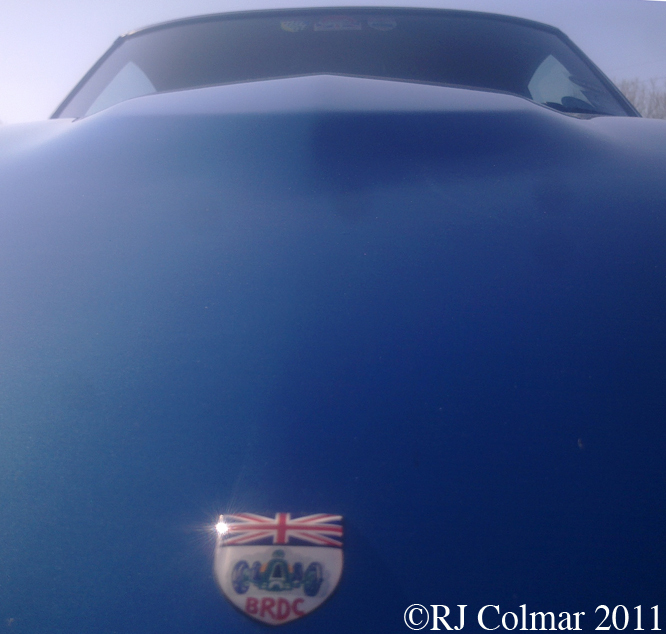 BRDC are the initials of the British Racing Drivers Club and signify that the owner of this vehicle, well known rally and racing driver Barrie ‘Whizzo’ Williams, is a member. 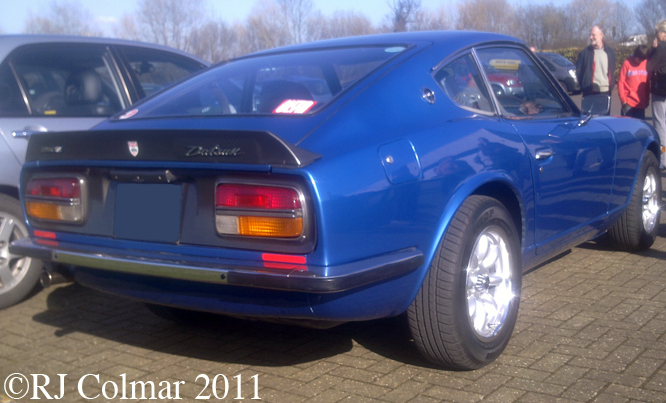 The Datsun 240 Z, featuring styling cue’s taken from the E-Type Jaguar, was in production from 1970 – 1973. 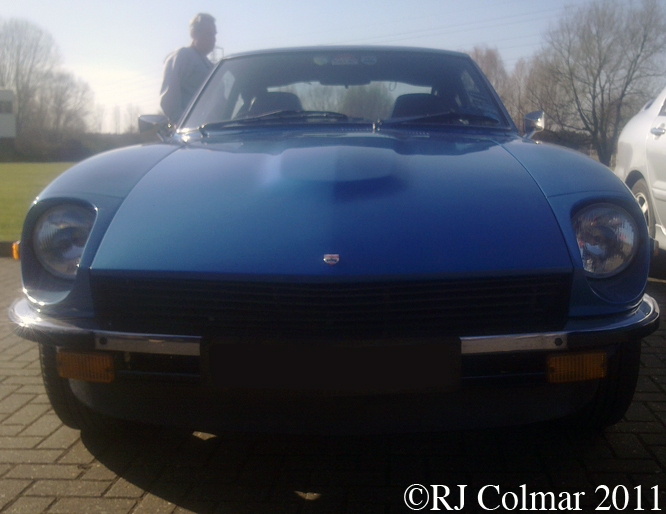 Unknown to me until I wrote this, in Japan 2 litre / 122 cui in line 6 cylinder versions of the 240 Z, known locally as the Nissan Fairlady Z, were available with single and double overhead cam options. 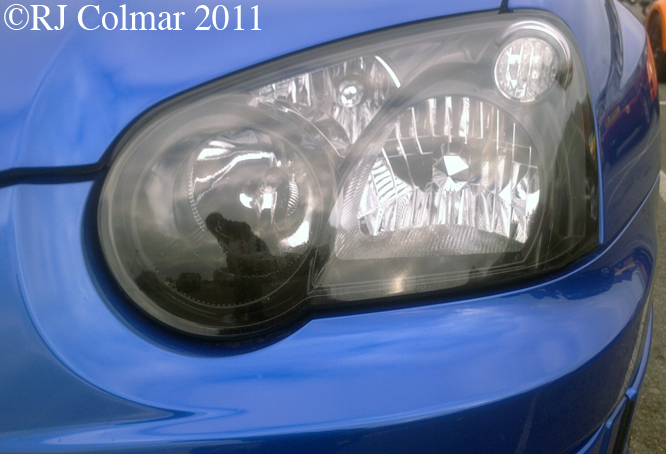 For the rest of us the 150 hp 2.393 cc / 146 cui single overhead cam six cylinder is the more familiar motor. 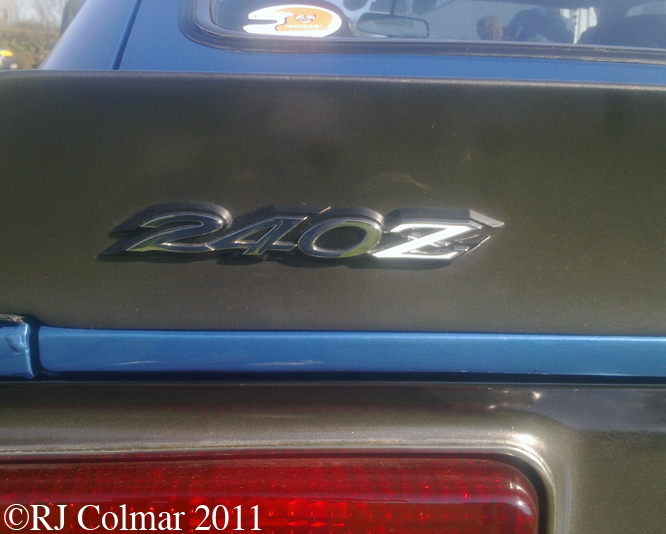 This vehicle is easily identified as a second series model by the Z in the circle on the C pillar. Amazingly in 1971 and 1973 Datsun 240 Z’s driven by Edgar Hermann and Shekhar Mehta respectively won the gruelling East African Safari Rally proving this was no flimsy boulevard cruiser. In 1996 Nissan launched a programme to buy 240 Z’s back and restore them to factory specifications and sold them for $24,000. Hope you have enjoyed today’s Fairlady edition of ‘Getting a lil’ psycho on tyres’ and that you will join me again tomorrow. Don’t forget to come back now ! 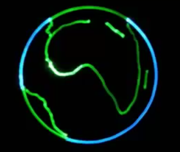 This entry was posted in Uncategorized and tagged 240, African, Art, Barrie, Datsun, East, Edgar, Fairlady, Hermann, Mehta, Nissan, Psycho, Rally, Safari, Shekhar, Tidesco, Tyres, Whizzo, Williams, Z on July 23, 2011 by psychoontyres. 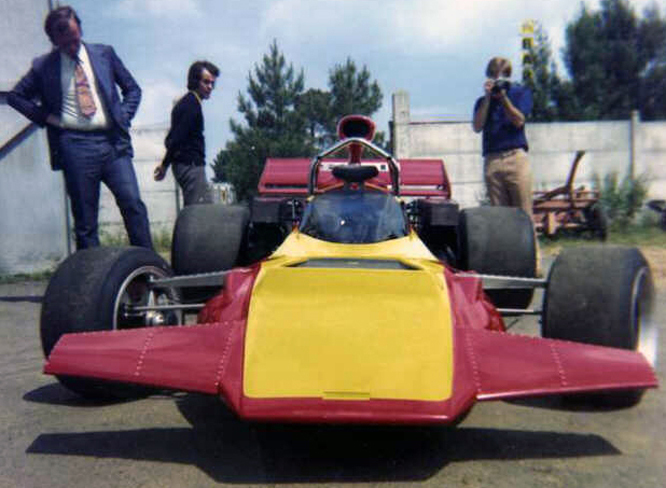 Continuing the improbable but never the less true story of the Connew Grand Prix team that I started on Boxing day today I am looking at some of the trials and tribulations the team had preparing for the French Grand Prix in 1972. 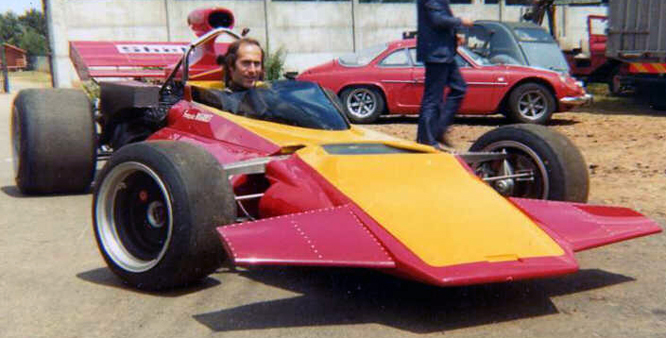 Having built thier car with a dummy engine as seen in the previous Connew blog, Peter managed to secure funding from a French consortium lead by Vincent Mausset to run Francois Migault in 5 races. The funding took the form of a ‘wad’ of French Francs which Peter, his cousin Barry and chief mechanic Roger Doran could only exchange to Pounds Sterling at £30 a time, thanks to foreign currency exchange restrictions in operation at the time. 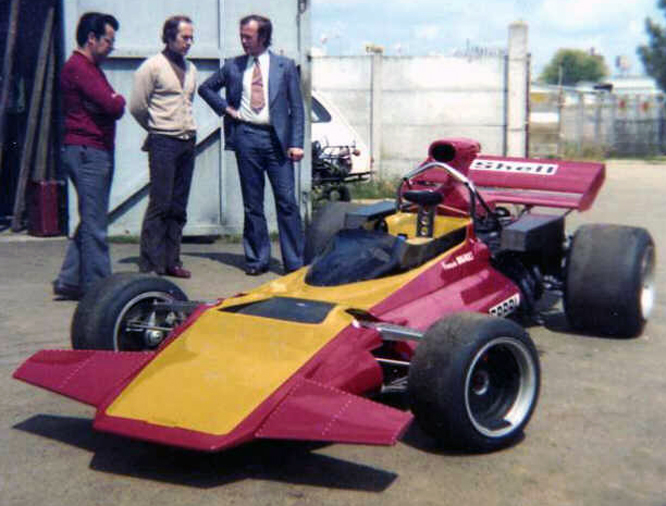 Peter managed to put a deposit down on a second hand Ford Cosworth DFV engine, in need of a rebuild, from Phil Kerr at McLaren, and purchased a brand new gearbox. Francois borrowed a truck from his brother who was in the furniture manufacturing business with a company called SAPAL, in return for the truck which was used as the teams transporter SAPAL stickers appeared on the Connew. 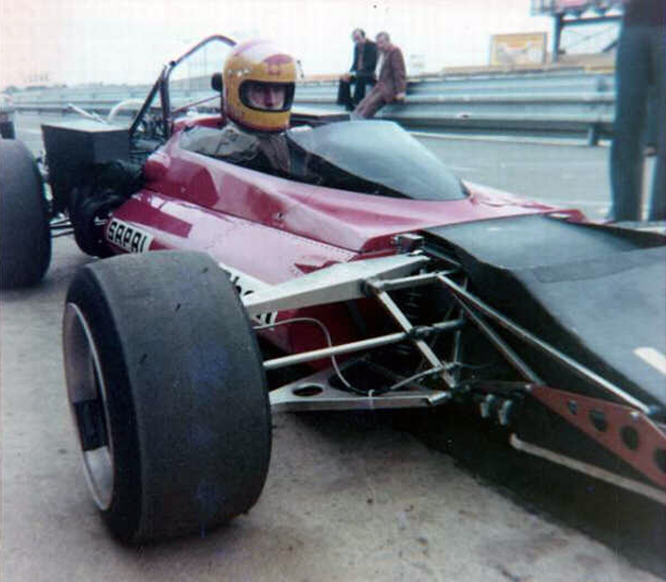 While final preparations of the car were made for it’s first Grand Prix and the truck was fitted out for racing car transporter duties, Barry got married, heroically spending just 24 hours with his bride before returning to help the team at it’s lockup in Chadwell Heath. FInally the team was ready to go with a truckie named ‘Mansell’ at the wheel of the SAPAL transporter, in Portsmouth customs officials were reluctant to let the truck leave the country because it was on French registration plates but the driver ‘Mansell’ was English. Once in France just outside Le Mans the trucks engine blew up. The truck was towed to Le Mans, Francois home town and the team used the Le Mans Bugatti Circuit, where these photos were taken, to do some testing while the truck was repaired. On the first day of testing it became apparent that the cars suspension had been damaged in transit and with that the teams plans to go to the French Grand Prix had to be abandoned while repairs to the car were made. With thanks to Peters cousin Barry Boor for the photographs if you’d like to read the whole story of how the Connew team came together over a period of two years and it’s trials and tribulations the year after please read Barry’s account of his part in this ‘Boys Own‘ adventure here. 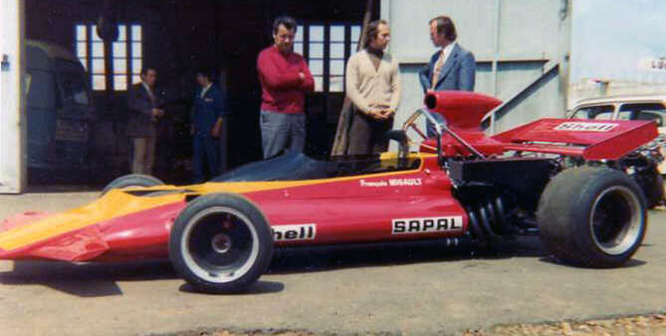 Hope you have enjoyed the second part of the Connew story and that you will join me again tomorrow for Ferrari Friday. Don’t for get to come back now ! 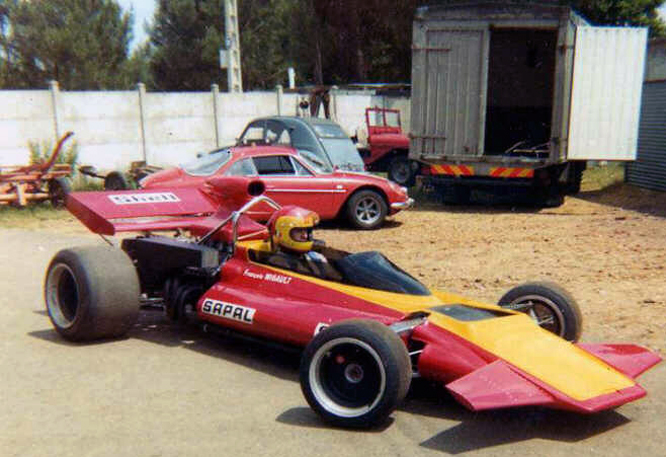 This entry was posted in Uncategorized and tagged Art, Barry, Boor, Chadwell, Connew, Formula, Francois, French, Grand, Heath, Migault, One, PC1 02, Peter, Prix, Psycho, Rindt, Tidesco, Tyres on June 9, 2011 by psychoontyres. The 1964 Monte Carlo Rally boasted a superb entry including factory backed vehicles from Citroen, Ford, Mercedes, Saab, Volvo, Volkswagen and a fleet of 6 works Mini Coopers. Starting from Athens, Frankfurt, Glasgow, Lisbon, Minsk, Monte Carlo, Oslo, Paris and Warsaw, the field converged on Rheims in France and from there on to 5 competitive stages and a couple of laps of the Monaco Grand Prix track. The Ford Falcon Sprint of Bo Ljungfeldt won every stage of the rally including the laps around Monaco but in those days the overall results were determined by a handicapping system which translated stage times and engine size into points which meant Ljungfelds 305 hp 4.7 litre 289 cui Falcon did not have a sufficient time margin over the 70hp 1071cc / 65 cui Mini Cooper S seen here crewed by Paddy Hopkirk and Henry Liddon which was declared the winner of the 1964 Monte Carlo Rally. 33 EJB is thought to have been built in 1963 and crewed by Hopkirk and Liddon to 3rd overall and 3rd in class in the 1963 Tour de France prior to winning the 1964 Monte Carlo Rally. The car belongs to the Heritage Motor Centre at Gaydon and is seen here at the Prodrive workshops because the engine was not running properly. Like the Revenge Mini Replica I blogged about some months ago 33 EJB also has it’s Replica’s like this one built in the USA. 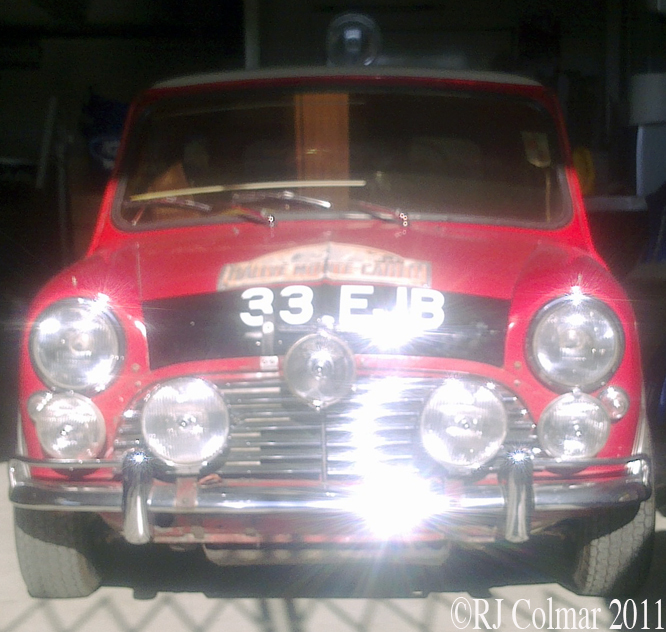 Finally I’d like to correct an oft repeated error reference the registrations of the works Mini’s on the 1964 Monte Carlo Rally seen in the 5th paragraph of this link. 33 EJB #37, Hopkirk/Liddon, Cooper S, 1st overall/1st in class. 477 BBL #39 Baxter/McMillan, Cooper 43rd overall/2nd in class. 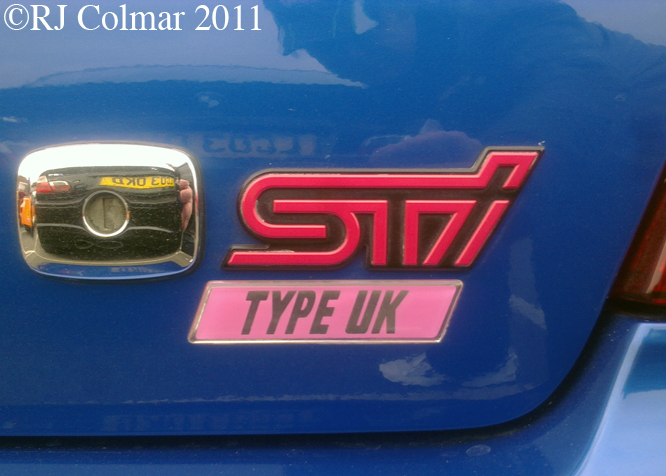 My thanks to Alan, Tim, Stephen, Darren, Fred at The Nostalgia Forum who helped me out with the registration numbers. Hope you have enjoyed to days Handicap edition of ‘Gettin’ a lil’ psycho on tyres’ and that you will join me again tomorrow. Don’t forget to come back now ! 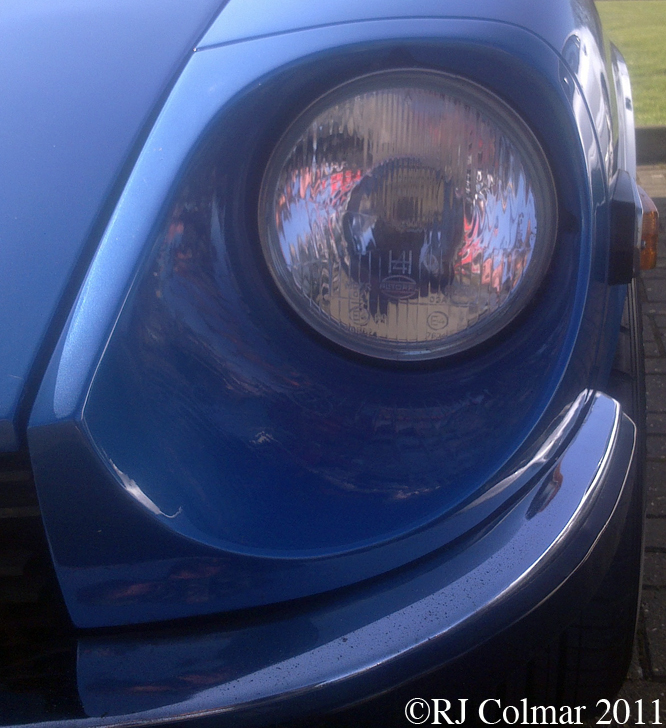 This entry was posted in Uncategorized and tagged Art, Carlo, Cooper, Forum, Gaydon, Hopkirk, Liddon, Mini, Monte, Nostalgia, Prodrive, Psycho, Rally, S, The, Tidesco, Tyres on April 13, 2011 by psychoontyres. Regular readers may remember a couple of months ago when i visited the Morgan factory I happened across Charles Morgan’s limited edition Aeromax. 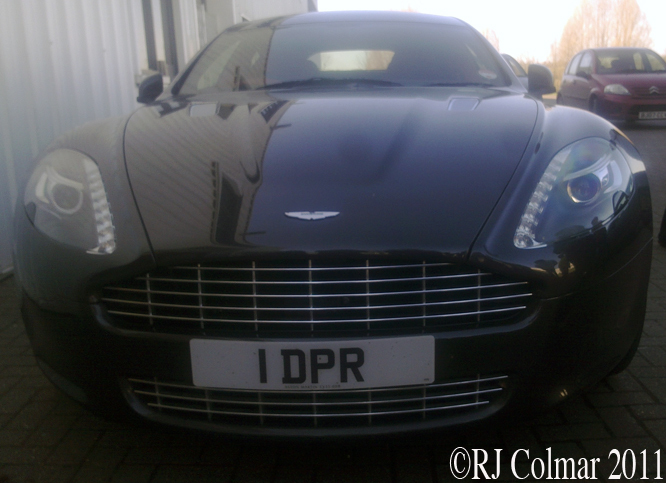 A couple of weeks ago I happened across Dave Richards, personal transport this fabulous ‘large and in charge’ Aston Martin Rapide while visiting Prodrive. The Rapide is Aston Martin’s top of the range 4 door saloon, a successor to the Aston Martin V8 based Series 1 Aston Martin Lagonda of 1974/74 of which just 7 were built. 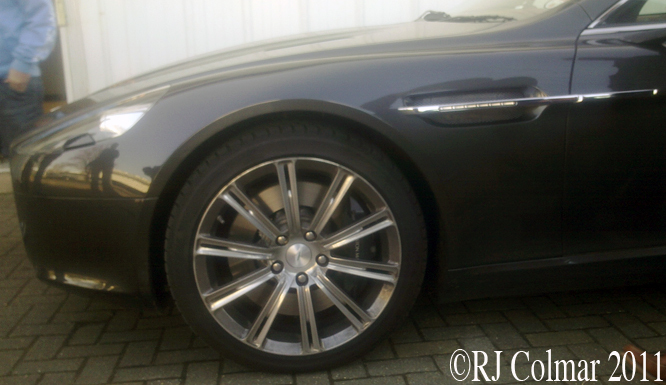 that is shared in common with both the DB9 and V12 Vanquish. 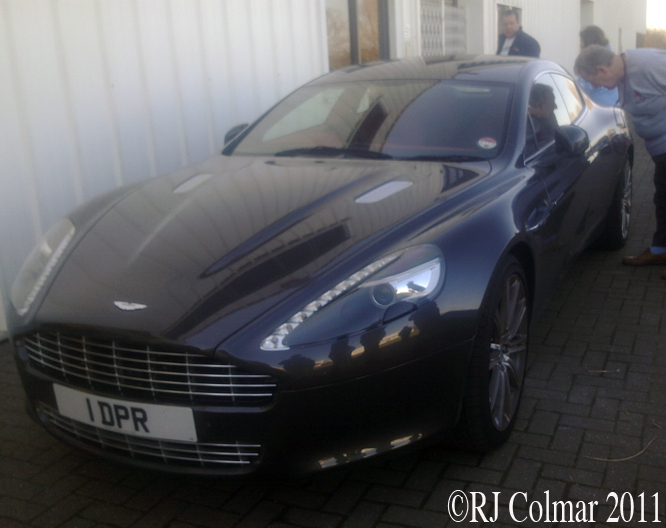 This is only the second Rapide I have ever seen and it still surprises me how graceful this four dour DB9 looks. 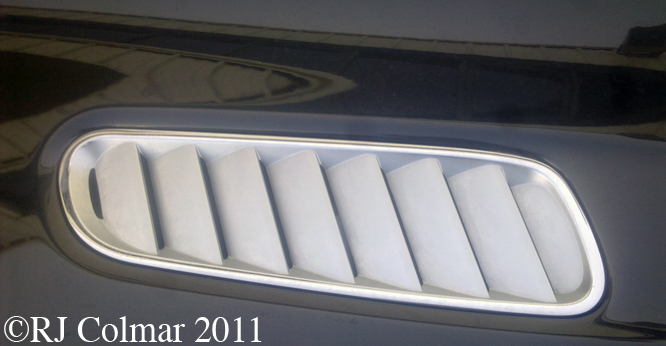 Surprisingly this range topping model of of a well known British Marque is actually assembled at a dedicated Magna Steyr plant in Graz, Austria. The standstill to 62mph performance time of 5.2 seconds and top speed of 184 mph will undoubtedly helped a near standard Rapide take second in class during the 24 hour race at the Nurburgring in 2010. 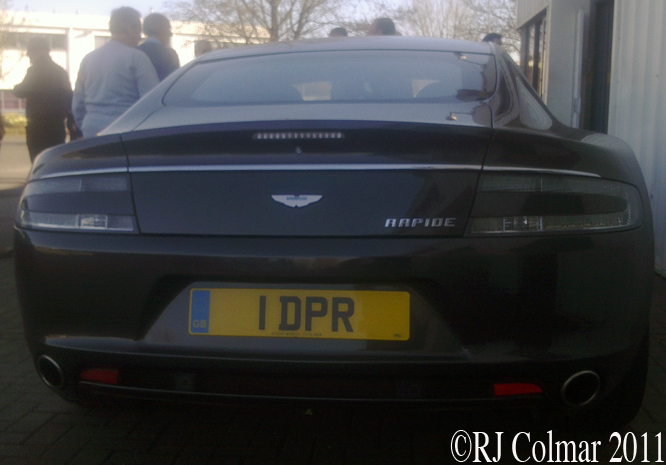 More on Aston Martin and the Rapide Luxe can be seen up the Drive Channel. Hope you have enjoyed today’s Austrian built edition of ‘Gettin’ a lil’ psycho on tyres, and that you will join me again tomorrow. Don’t forget to come back now ! 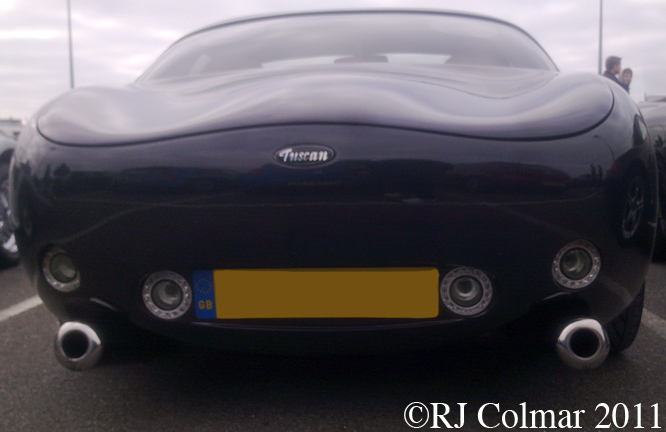 This entry was posted in Uncategorized and tagged Art, Aston, Ausrtria, Dave, DB9, Graz, Lagonda, Magna, Martin, Prodrive, Psycho, Rapide, Richards, Steyr, Tidesco, Tyres, V8 on April 11, 2011 by psychoontyres. 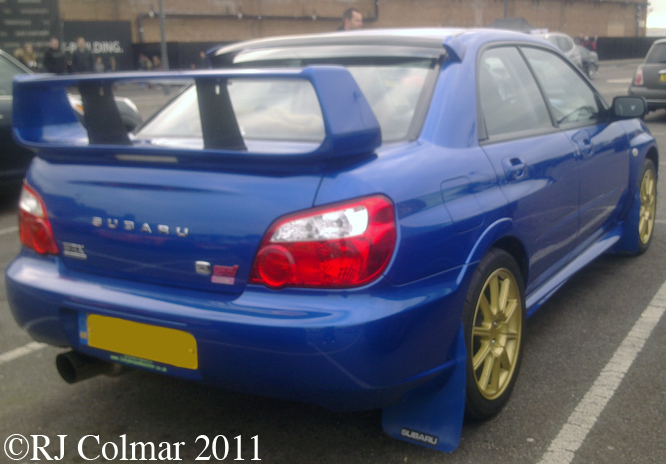 Top of the 2007 Subaru Impreza range was the WRX STi with 260 hp, considered at the time the default Rally Replica of Choice in some circles. 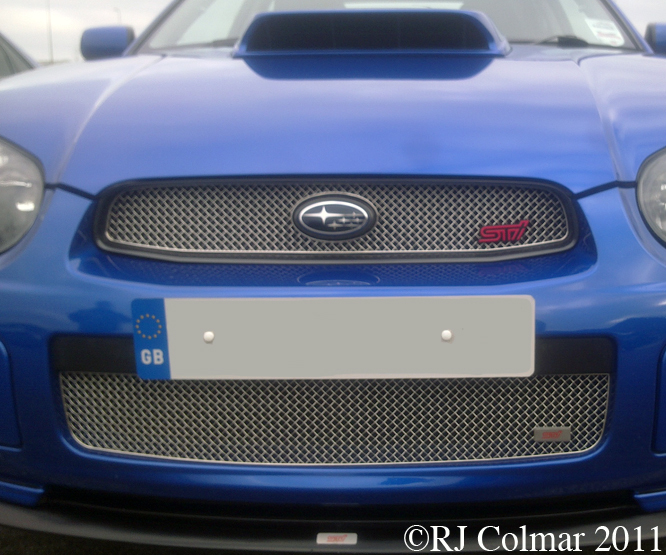 The STi Type UK was available with an optional 300 hp engine with Prodrive re engineered engine parts that were stronger and or lighter than the originals including a larger air intake and intercooler. and 10 spoke gold alloy wheels attached to a reengineered suspension which is more stable than the standard Subaru Impreza WRX STi. Prodrives Driver Control Centre Differential System (DCCD) allows the driver to control the oversteer (loose) and understeer (push) characteristics of the car by adjusting the front to rear torque balance delivered to the four driven wheels. 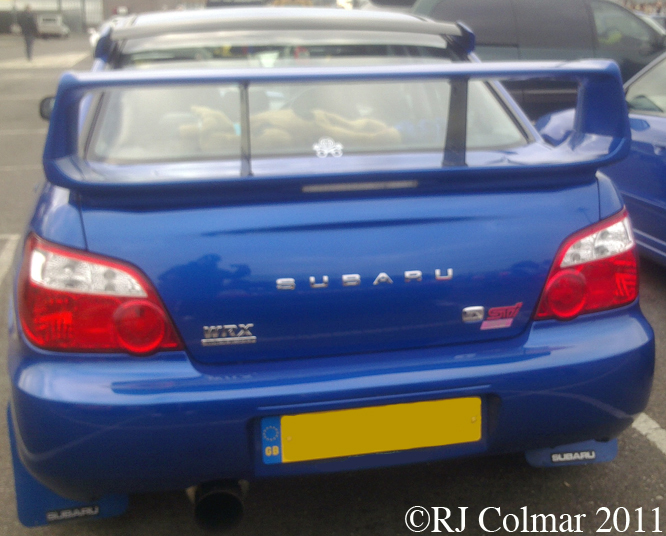 Against the contemporary Mitsubishi Evo the STi Type UK appeared the the more reasonable value. 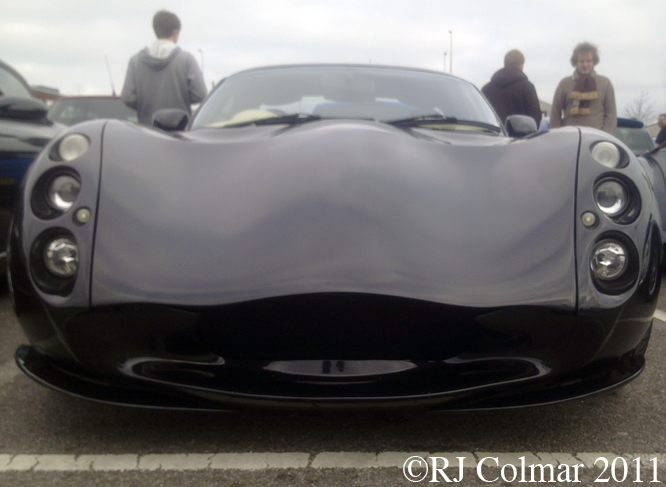 My thanks to the Pistonhead who brought this Type UK along to the Sunday Service at the BMW plant back in January. Hope you have enjoyed today’s Type UK edition of ‘Gettin’ a lil’ psycho on tyres’ and that you will join me again tomorrow. Don’t forget to come back now ! 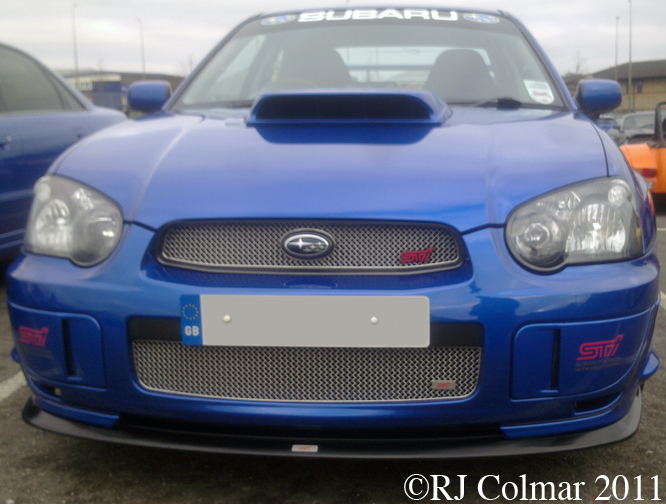 This entry was posted in Uncategorized and tagged Art, Art Tidesco, BMW, DCCD, Impreza, PistonHeads, Plant, Prodrive, Psycho, Service, STi, Subaru, Sunday, Thatcham, Type, Tyres, UK on April 10, 2011 by psychoontyres. The ALFA Romeo 2000 GTV was part of the 105/115 Series Coupés in production from 1963 to 1977, it is thought that 37,459 2000 GTV variations were produced from 1971 to 1976. The Bertone penned bodywork was built onto to shortened Giulia Berlina floorpan, all 105/115 Series Coupés used four cylinder all alloy twin cam engines, this particular one has the largest 1962 cc / 119 cui motor that came equiped with carburettors and was good for 150 hp. 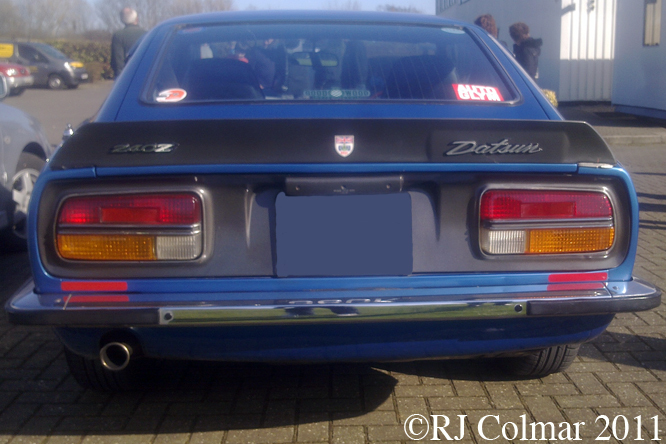 An undetermined number of 105/115 Series Coupés were assembled near Petoria in South Africa allegedly alongside other knock down kits including Datsun’s. 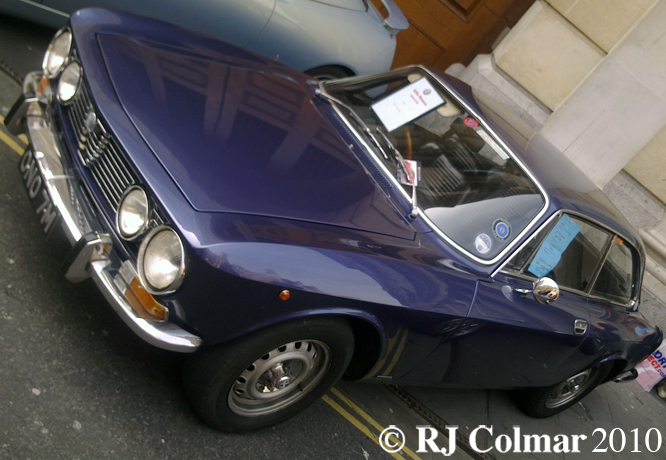 Date for your diaries Saturday April 16th Bristol City Centre will be hosting the Italian Auto Moto Festival, today’s photo’s as were many others featured here over the last 6 months were taken at this event last year. 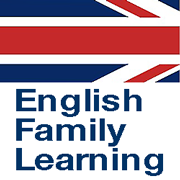 E-mail me if your planning to attend it would be great fun to meet up. 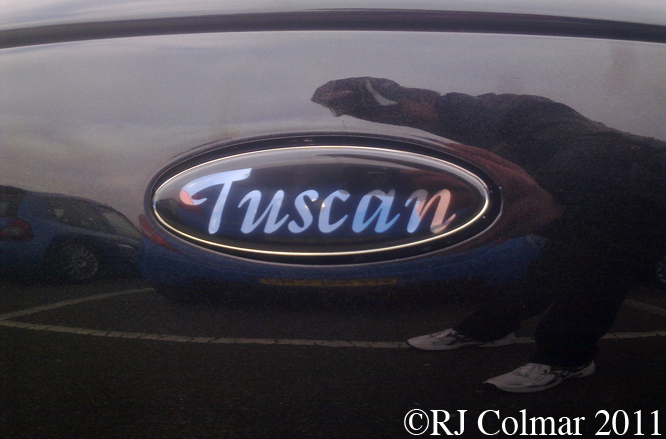 Hope you have enjoyed today’s all alloy twin cam edition of ‘Getting a lil’ psycho on tyres’ and that you’ll join me again tomorrow. Don’t forget to come back now ! 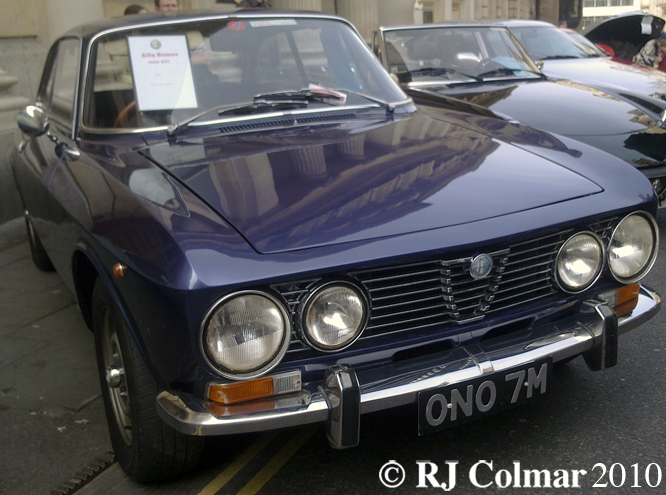 This entry was posted in Uncategorized and tagged 2000, Alfa, Art, Auto, Bertone, Festival, Giulia, GTV, Italian, Moto, Psycho, Romeo, Tidesco, Tyres on April 9, 2011 by psychoontyres.